Mariandina A repairs body cells and tissues, cleanses, provides stress relief and energises the body. Shipping: 4.95pounds(£) for shipping within UK mainland. All shipments dispatched within 48 hours. 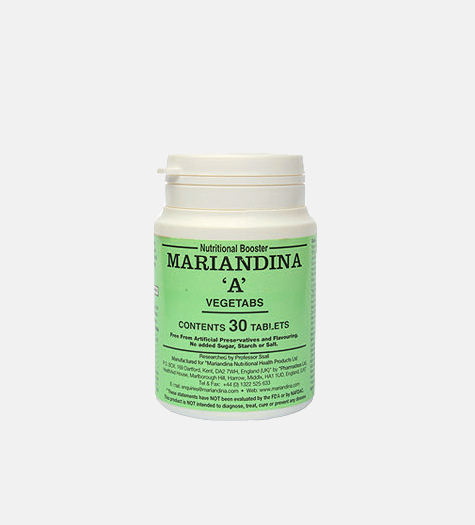 Tag: Mariandina A Contains 30 Tablets Per Bottle. 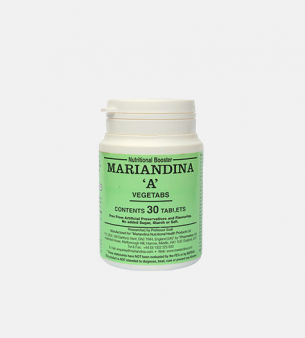 Mariandina A is an advanced unique natural composition consisting of 28 natural herbs, vitamins, minerals and rare elements such as Vitamin C, Vitamin A, Vitamin E, Vitamin B6, Vitamin B12, Folicacid, Citrus Bio flavanoids, Iodine, Niacin, Biotin, Calcium, Zinc, Iron, Selenium, Copper, Manganese and Ginseng plus many more which uplift the Immune System, revitalise the body cells and tissues, and rejuvenate the body.